For creating an excellent experience for customers, the AES-APL1E1FL offers great computing power thanks to Intel Pentium Apollo Lake N4200 processor and built-in Intel HD Graphics 505 for digital process like a self-ordering Kiosk, drive-thru systems, entertainment services, etc. 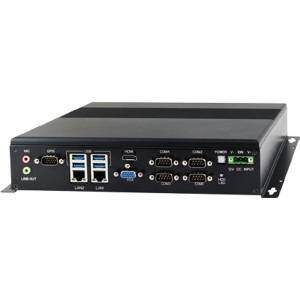 The fanless embedded system is designed with up to 8GB DDRL SO-DIMM RAM memory and two swappable 2.5” disk bay with anti-vibration/anti-shock solution for SSD. Equipped with a three Mini PCIe expansion slots system can extend with wireless interface such as Wi-Fi or 4G LTE. Also, are available four SMA antenna hole for GPS, 4G, Wi-Fi and Bluetooth. The I/O ports include 3xRS232 and 1xRS232/422/485 for serial device connection, four USB 3.0 and 8-bit GPIO for digital data transfer. 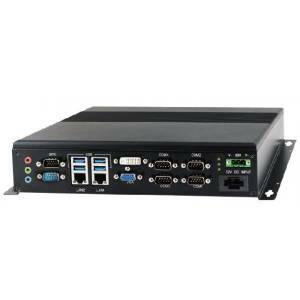 For video transfer system has two video output ports – VGA (DB15) and HDMI. The AES-APL1E1FL embedded system is equipped with ultra slim housing with following dimension - 260 mm x 195 mm x 62 mm, and can operate in extended temperature range from -25C to +60C.